I loved this book, but I also wanted to chuck it accross the room. I can't wait for the next book in the series. 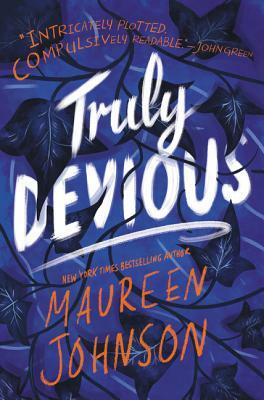 New York Times bestselling author Maureen Johnson weaves a delicate tale of murder and mystery in the first book of a striking new series, perfect for fans of Agatha Christie and E. Lockhart. Shortly after the school opened, his wife and daughter were kidnapped. The only real clue was a mocking riddle listing methods of murder, signed with the frightening pseudonym “Truly, Devious.” It became one of the great unsolved crimes of American history. True-crime aficionado Stevie Bell is set to begin her first year at Ellingham Academy, and she has an ambitious plan: She will solve this cold case. That is, she will solve the case when she gets a grip on her demanding new school life and her housemates: the inventor, the novelist, the actor, the artist, and the jokester. But something strange is happening. Truly Devious makes a surprise return, and death revisits Ellingham Academy. The past has crawled out of its grave. Someone has gotten away with murder. The two interwoven mysteries of this first book in the Truly Devious series dovetail brilliantly, and Stevie Bell will continue her relentless quest for the murderers in books two and three. Maureen Johnson is the bestselling author of several novels, including 13 Little Blue Envelopes, the Truly Devious series, the Suite Scarlett series, and the Shades of London series. She has also written collaborative works such as Let It Snow with John Green and Lauren Myracle and The Bane Chronicles with Cassandra Clare and Sarah Rees Brennan. Maureen lives in New York and online on Twitter @maureenjohnson or at www.maureenjohnsonbooks.com.